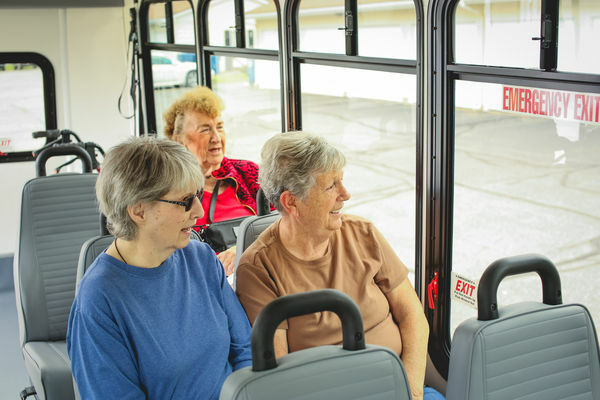 Once you are eligible to ride GO!Bus, make a reservation for your ride by calling 616-456-6141. The Rapid does not restrict the number of trips an eligible individual will be provided. Call at least one day in advance (by 4:30 p.m.) and no more than 14 days in advance. Monday through Friday: 6:30 a.m. to 4:30 p.m.
Saturday and Sunday: 8:30 a.m. to 4:30 p.m. Note: The office is open until 5 p.m. for inquiries and checking on trips. 8:30 a.m. to 4:30 p.m. for next day ADA service only. You will be prompted through a phone message to leave trip request information. Your trip will be scheduled for the day after the holiday. Should there be any questions about the message left, you may receive a call from a customer service representative to obtain more information. The ADA allows The Rapid to negotiate a scheduled pick-up time within one hour before or after the requested time. When you request a certain time, the call-taker will let you know what is available within that two-hour time frame in order for you to access Go!Bus transportation. All attempts are made to give callers their preferred time. When a time is scheduled, the passenger has to be ready and waiting for the vehicle 10 minutes before the scheduled time through 15 minutes after that time. The vehicle will arrive within that 25 minute window. Can I make a standing reservation? Persons traveling regularly on the same day(s) of the week to and from the same locations at the same times may be able to make a standing-order reservation depending on availability. Standing orders must remain in effect with no changes for at least 90 days. Once made, a standing order reservation remains in effect until changed or cancelled by the passenger or by The Rapid. Excessive cancels and/or no-shows may result in loss of a standing order. What if I have a weekday medical appointment that is open-ended? For weekday medical trips only, reservations will be accepted without a set return time, also known as a will-call trip. Let the call-taker know you will need a ride home from your medical appointment at the time you schedule your trip. You must call the GO!Bus office only when ready to leave the location and a vehicle will be dispatched to pick you up and should arrive within 45 minutes. Passengers who must cancel should call the GO!Bus office at 616-456-6141 no later than 30 minutes before the scheduled pick-up time. Go!Bus operators are NOT authorized to accept cancellations in reservations. Passengers who must reschedule or change their ride reservation must call the GO!Bus office at 616-456-6141 no later than 24 hours before the trip is scheduled. Same day changes are not accepted. Operators are NOT authorized to accept changes in reservations. What is the Go!Bus no-show policy? Scheduled return trips for no-shows will be canceled automatically unless you call the GO!Bus office more than 60 minutes prior to the scheduled pick-up time for the return trip. Any person with a pattern of repeated no-shows may have their service suspended.